Astigmatism can cause blurred vision, excessivesquinting, fatigue, eye strain and, in extreme cases, headaches and migraines. Some astigmatism cannot be corrected with the use of spectacle lenses, but it can be corrected by contact lenses.Daily disposable contact lenses are an affordable way to easily manage vision problems. Specialized moist contact lenses are an excellent choice for astigmatism sufferers who also get dry eyes. 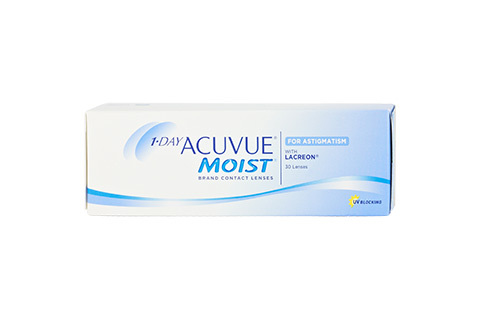 1-Day Acuvue Moist for Astigmatism Daily Disposable lenses from Johnson &Johnson are an ideal way for astigmatism sufferersto avoid negative vision effects. Each lens is manufactured with unique LACREON technology that locks moisture-rich ingredients into the lens to ensure you can go a full day without feeling irritated by dry eyes. These lenses are developed to ensure clear and stable vision, no matter how active you are. Join the Mister Spex family and shop online to take advantage of same day shipping (if ordered before 2pm), fast DHL delivery and free returns within 30 days if you change your mind on your purchase. Choose from thousands of glasses from a range of designer label including Ray Ban, Oakley and Adidas or buy your next contact lenses from Acuvue, Biomedics, Proclear all from our safe, easy to use online store.